Cirque du Soleil: Worlds Away takes audiences on a wondrous journey across the imaginative landscapes of Cirque du Soleil. 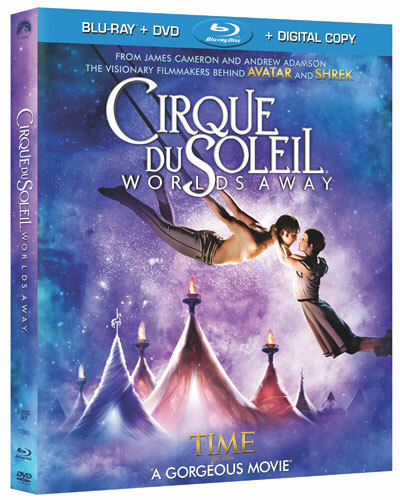 Capturing the feats of the extraordinary artists up close using cameras that sometimes soar 70 feet in the air, Cirque du Soleil: Worlds Away “immerses audiences in…the inspiring acrobatics of the world’s most glamorous circus troupe” (Time Out New York Kids). From spectacular sets and dazzling costumes to the fantasy of enchanted worlds,Cirque du Soleil: Worlds Away gives viewers “a chance to experience the wonder of the circus from a perspective you’ll never get ringside” (Chris Knight, Postmedia News). What an amazing show. I have always wanted to see Cirque Du Soleil in person, who hasn't?! So when given the opportunity to review a party pack for the release of their DVD/Blu-ray combo, Worlds Away, I quickly jumped at it. The party pack included lots of treats for me to enjoy, so I had a couple of girlfriends over and we watched this beautiful show while eating the chocolate caramel popcorn that was also in our kit along with a glass of wine and some delicious finger foods to munch on. The quality of the blu-ray was magnificent and just gave me more reason to want to see this in person. I've added this to my bucket list, because I'm sure this show is worth seeing live. After watching the show we listened to the Beatles's album that was included in the party pack, what a joy to have in my collection of music now. If you have yet to see this show live I definitely recommend watching it on the blu-ray dvd combo. It may not feel exactly the same, but it's definitely close and will get you wanting to see the show live! Disclosure: All opinions are my own. I received Cirque Du Soleil party viewing package at no cost for the purpose of this review. No other compensation was received.